My mom makes the most beautiful quilts. Not only are they visually appealing and artfully made with an eye for color placement, they are also technically perfect. Every seam lines up perfectly, every corner is exactly square. She's able to achieve this level of perfection because she's a fusser. And a measurer. And a ripper-outer and re-doer if necessary. Me, on the other hand, I'm a fly-by-the-seat-of-my-pants, I'm-sure-it-will-be-fine-when-it's-finished, nobody-will-ever-notice-that-little-goof type of person. If it weren't for the fact that we agree on most other things, I'd wonder if I was adopted. Seriously. She uses recipes and measures. Right down to 1/4 teaspoon. My philosophy is that a half teaspoon is some, 1/4 t is a little less, and a teaspoon is a little more. 1/8 t is a smidge and anything less than that doesn't even show up on my radar. My mom? Yes, she measures 1/8 t if the recipe calls for it. She also keeps a ruler in her kitchen drawer and if a recipe calls for rolling something out to a 8" circle... Yep. Hers is 8". Although this kind of attention to detail is not my forte, I do have to admit that her recipes turn out the same every time. Mine? Not so much. And it frustrates my mother in law to no end when she likes something I've made and asks for the recipe. Honestly, though? After 25 years of this, she out to know there isn't going to be one. So... what did I start to tell you about before I wandered off on a random topic? Oh, yes - sewing. My mom sews. I do not. She tried to teach me - really, she did (and still has the grey hair to prove it). You can imagine how much fun that was for her given our personality differences in this area! I suppose it should be said that I technically possess the knowledge necessary to sew. I have sewn. I could sew again, but only if it would save someones life or right some catastrophic wrong or something. You know... like if I sew this seam, the hostages will be set free:) Barring that, I'm not gonna do it. My kids didn't even know sewing was possible until one time we were at my parents' house visiting and my daughter came out with a pair of her pajamas with a rip in the shoulder seam. My mom took them and stitched that right up and my daughter was flabbergasted! Who KNEW you could FIX clothing! 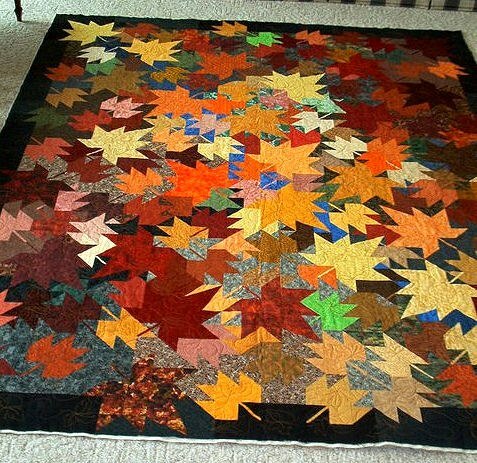 This is the Autumn quilt my mom made for me and it's fantastic. Thank goodness for her fussing and measuring tendencies. Oh, did I mention my mom alphabetizes her spices? That's a beautiful quilt! I guess we all have our strengths, and it would be a boring world if we all did the same things in the same ways. That is a beautiful quilt. Getting corners to fit is amazing. I have made a few quilts and I am much like you in that regard, although I do measure. When I cook I only measure carefully when I bake. I freely make substitutions. My spices are not alphabetized (I had to laugh at that) but my paperback books are. We all approach our creativity differently and it seems to work out. 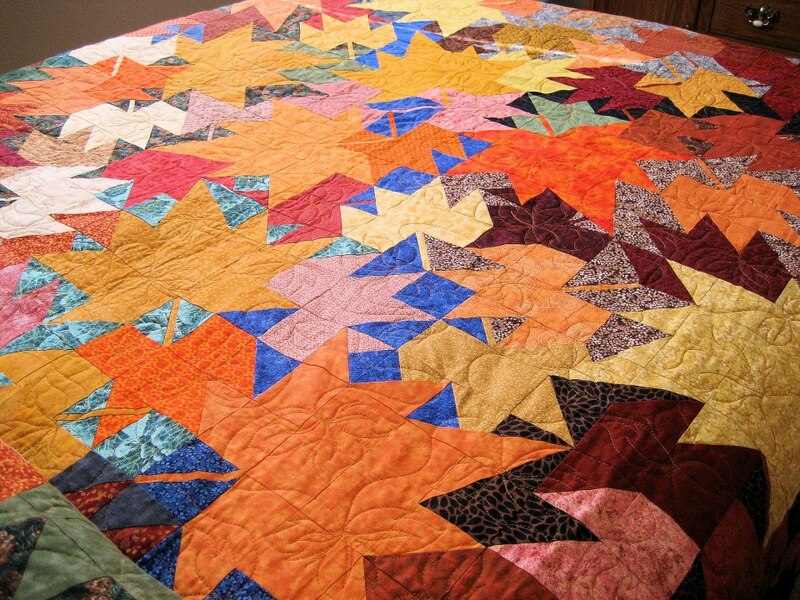 That quilt is STUNNING and a testament to your Mother's patience and artistry.... we all do things differently... I don't believe anything is either right or wrong in that regard.. just a different approach. I am betting you approach your jewelry making in a methodical manner though! I will admit my jewelry making is a bit more organized than my cooking - and thank goodness for that:) It helps that no sewing machine is involved, too. My spices (the important ones, that is) are alphabetized, but I cook using your method--some, less, a smidge, etc. Forget sewing, quilting, or anything that requires real measurement (like your patterns)! I just want a mom who will make that quilt for me!!!! I grew up in a place and time when EVERYONE sewed, quilted, embroidered, etc., etc.. We took these skills for granted. I love to see these gorgeous works being viewed today as the art they truly are! I think your mother's quilt is an exceptional example of what we called simply "une couverture" (a covering) in my youth. Her colour and design choices are inspired, Sherri! Your Mom sounds like my kind of gal.....I also make quilts. I have been published in one of Barbara Brackman's books on Slave Quilts. Like your mother, my seams are perfect my points are actually points and things are quite nice. However, one thing I like to do in my quilts is done on purpose, but where the pattern would usually call for a green piece, I will add one blue piece in some inconspicuous place. I have done stuff like that in all of my quilts - my nieces and nephews were always excited to find the "mistake" every time I finished a quilt. Now that they are grown, they could care less that I even make quilts. But, when it comes to the way your Mom cooks.....well, now she's sounding just crazy. I keep all of my spices in a big tub and have to dig through them every time I want something and measuring....well there's no room for that in my life. Enjoyed your post, your Mom sounds great. My Mom is great too.